Every Friday morning after morning prayers at the Huxi Mosque on Changde Lu, Shanghai's weekly Muslim Market starts up, a meeting place for the city's predominately Islamic Uyghur population. 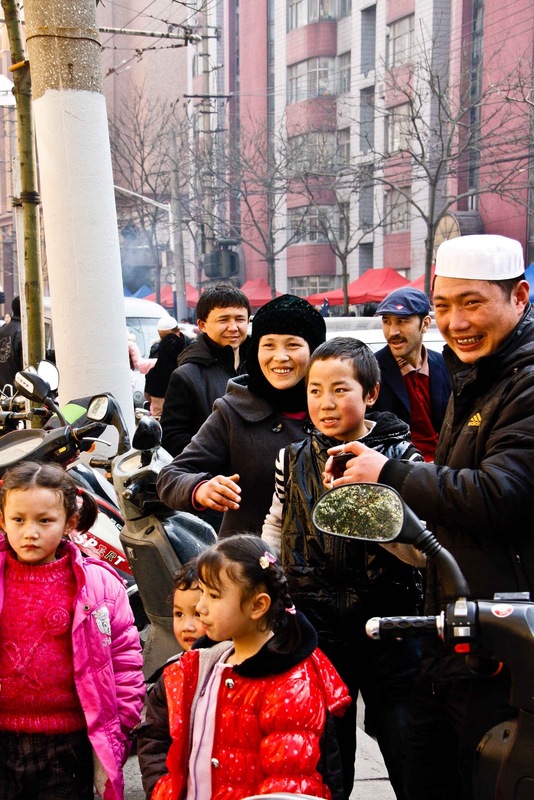 The Uyghurs hail from Xinjiang, in far north-western China, and their cuisine is more closely associated with Central Asia - mutton, flatbreads, kebabs, samsa (samosas) and rice, flavoured with chili, cumin and pepper. The market is only small but has a great selection of foods on offer, and I'll write more about these in a coming post. One of the popular dishes at the market is mutton polo پولۇ (pilaf). 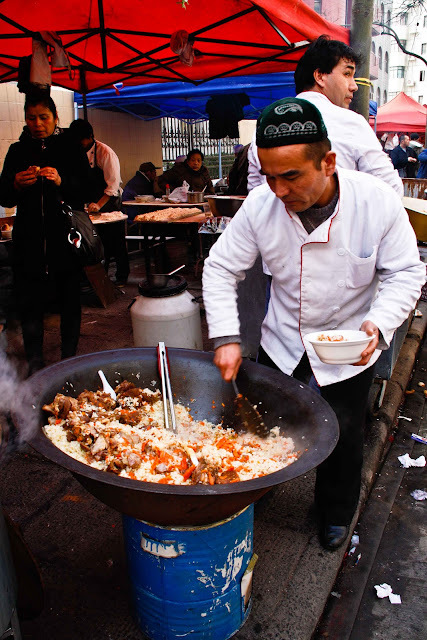 This man is cooking an enormous pan full of delicious savoury rice, flavoured with shreds of sweet carrot and studded with plump Xinjiang sultanas, and topped with chunks of flavoursome lamb as soft as butter. The lamb (or mutton) has to be quite fatty so that the polo can be flavoured by the melted fat. You can sit alongside the stall on tiny plastic stools and eat your bowl of polo (10 yuan/bowl) with a steaming glass of Xinjiang tea. The markets have become a magnet for Shanghai's expat population who like the food of far north-west China, much to the interest and amusement of the Uyhgur customers, like this family below who spent some time intently watching us eat then photographed us all with their own children. They distracted me so much I forgot to take a close-up photo of my delicious pilaf before I'd eaten the whole lot! Enjoy some more street food here!